Both intrinsic and extrinsic biological causes of cancer drug resistance have been postulated. First, the overexpression of several transmembrane transporters in tumor cells, such as p-glycoproteins and multidrug resistance protein family members, reduces the intracellular drug concentration by restricting drug absorption and promoting drug efflux [7–9]. Second, changes in drug metabolism and drug targets, such as modifications of drug metabolizing enzymes by mutation and altered expression, lead to the dysregulation of prodrug activation and inactivation of the active form of the drug, thereby subsidizing the drug efficacy and promoting drug resistance [6, 10, 11]. Third, gene amplification in tumor cells increases the number of copies of oncogenes, which then reinforces oncogenic signaling during drug treatment . Mutations in DNA repair systems might also promote resistance to antineoplastic agents by increasing DNA mutations and adapt to the drug [12, 13]. Fourth, pre-existing or acquired tumor cell heterogeneity might lead to variation in the response of cancer cells to antineoplastic agents . For example, cancer stem cells, a subpopulation of cells that possess self-renewal and differentiation abilities, are more resistant to therapy than well-differentiated tumor cells . Human tumors consist of both epithelial-like tumor cells and their surrounding cells and extracellular components, such as vasculature, fibroblasts, immune cells, endothelial cells and extracellular matrix (ECM). The surrounding components interact with tumor cells to form a microenvironment that favors tumor cell proliferation and survival . 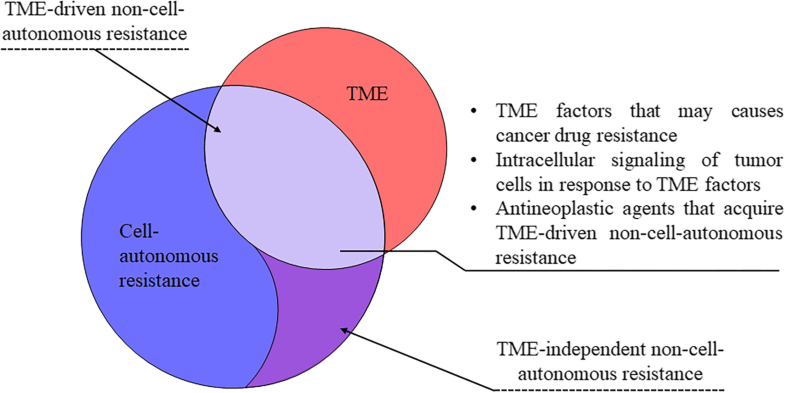 The concept of the TME was introduced to illustrate that cancer progression is influenced by factors other than tumor cells. As a result, it was postulated that the TME might mediate the acquisition of resistance when tumors are exposed to antineoplastic agents in vivo [16–18]. Indeed, noninherent-adaptive drug resistance refers to non-cell-autonomous resistance, which relies on the treatment process rather than genetic or epigenetic changes and is closely related to the TME . 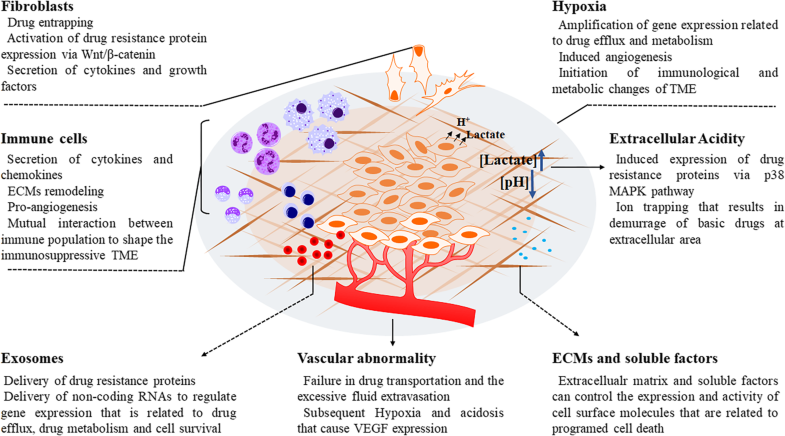 The TME may play a role in the initiation and maintenance of non-cell-autonomous drug resistance through various mechanisms, including hypoxia, extracellular acidity, vascular abnormalities, changes in immune populations, cancer-associated fibroblasts (CAFs) and their secretomes, exosomes, extracellular matrix, and other soluble factors. The overall regulatory mechanisms of non-cell-autonomous cancer resistance involving the TME are shown in Fig. 2 and have been reviewed in detail elsewhere [20, 21]. The mechanism involved in the non-cell-autonomous resistance to specific agents will be discussed later in this manuscript. STAT3 signaling is generally considered the pathway in tumor cells that responds to the inflammatory TME . A series of cytokines and chemokines can activate STAT3 in tumor cells, among which IL-6 and IL-1β are the major inducers derived from the TME. Tumor-associated macrophages (TAMs), neutrophils and CAFs in the TME are the major cell types that secrete IL-6 and IL-1β and are responsible for the activation of STAT3 in tumor cells . Several downstream effectors of STAT3 in tumor cells were reported to contribute to non-cell-autonomous resistance to antineoplastic treatment. STAT3 activation may confer drug resistance by initiating epithelial-mesenchymal transition (EMT), suppressing epigenetic tumor suppressor microRNAs (miRNAs) and enhancing the expression of antiapoptotic proteins [32–34]. STAT3 activation in the TME may trigger vascular abnormalities, which were shown to abolish the proper delivery of gemcitabine . STAT3 in tumor cells may also enhance the expression of Rab family proteins to facilitate exosome release, which confers cisplatin resistance in ovarian cancer . Overexpression of HER2 plays a crucial role in cancer development due to its function in stimulating cell growth and differentiation. HER2 inhibitors, including monoclonal antibodies and small-molecule TKIs, have been developed for the treatment of diverse types of cancer, especially breast cancer [97–99]. Recent studies have shown that TME-driven non-cell-autonomous mechanisms are involved in resistance to anti-HER2 treatment. Breast tumors next to adipose tissue were found to be more resistant to trastuzumab treatment, which could be associated with the adipose tissue-induced failure of antibody-dependent cellular cytotoxicity. Adipocytes reduce the secretion of interferon-γ (IFNγ) by natural killer cells and induced expression of survival genes in breast tumor cells, leading to trastuzumab treatment failure . Acquired resistance to another anti-HER2 therapy lapatinib was demonstrated in esophageal squamous-cell carcinoma cell lines; this resistance could be associated with CAFs-secreted molecules, including HGF and FGF, which activate the HGF/Met and FGF/FGFR pathways to induce significant resistance to lapatinib . Another study suggested that the spatial proximity of breast ductal carcinoma cells to CAFs also influences lapatinib resistance, as the induction of antiapoptotic Bcl-2/Bcl-x, PI3K/AKT ,and JAK/STAT signaling was observed in lapatinib-treated tumor cells, and this induction was associated with CAF-induced protection by HA in the stroma and with intercellular communication between tumor cells and CAFs through JAK/STAT signaling . In addition, ECM components such as laminin may affect breast ductal carcinoma sensitivity to lapatinib. Tumor cells in niches with laminin-enriched ECM express more antiapoptotic Bcl-2 family proteins and exhibited resistance to lapatinib . These previous studies suggest that multiple non-cell-autonomous mechanisms may be involved in the resistance of tumor cells to anti-HER2 treatment.